Sometimes, a wire isn’t enough. Heavy wood and metal frames, mirrors, large canvases, and other weighty art pieces need extra support. 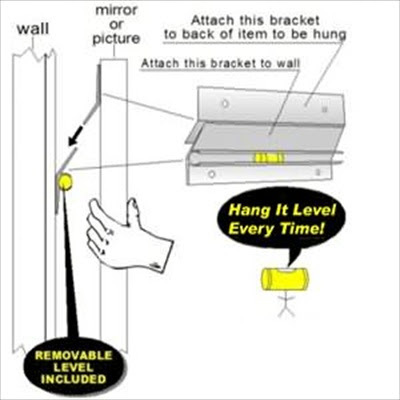 The Hangman® Hanging System is the perfect solution. Available in three styles, the Hangman® Hanging System employs a French Cleat style method, which uses a 30-45 degree slope that doesn’t bear the full weight of the item, but still sits flush against walls. Its interlocking design assures mounting stability, and its high-strength aluminum construction won’t rust or corrode. All three styles are easy to install and include a level, mounting screws, anchors, and packaged instructions, and hold from 40 to 200 lbs, depending on the style. 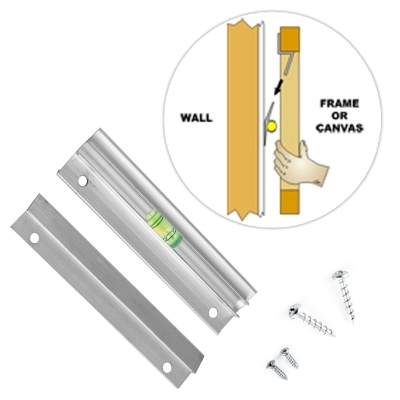 Item #F8110 - Extra strong wall mounting hardware designed for wood picture frames. An aluminum bracket attaches to the wall then into the wood frame. The bracket is 5 inches long and provides easy leveling with its built-in bubble level. This system holds up to 40 lbs when secured properly into a wall. Item #F8010 – This is the strongest hanging system we offer. 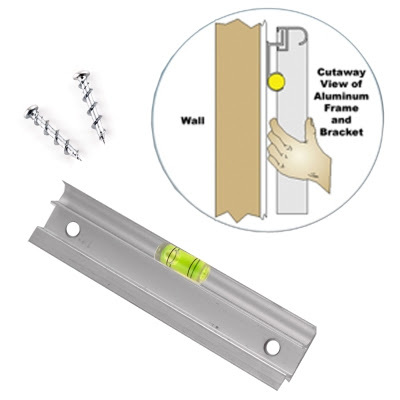 Featuring a built-in level and an 18” long bracket, this system holds up to 200 lbs when two screws are fastened into wood studs. With a Hangman® system, you’ll have peace of mind that your art won’t slip off or damage the wall so it can be enjoyed for years to come. For step-by-step installation instructions, watch this how-to video. Have a question? Give us a call. Our expert customer service team is ready to help. It's nice to know that there are alternative hanging methods for my larger works. I've always been worried that hanging it with just wire wouldn't be enough support and it would damage the wall or the frame.